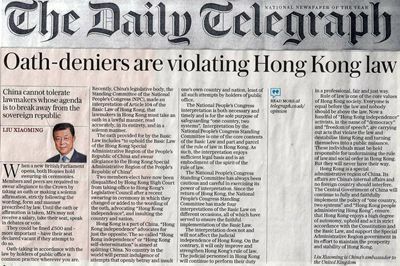 The Daily Telegraph Publishes A Signed Article by Ambassador Liu Xiaoming Entitled "Oath-deniers are violating Hong Kong's law"
When a new British Parliament opens, both Houses will hold swearing-in ceremonies. Members and peers are required to swear allegiance to the Crown by taking an oath or making a solemn affirmation, strictly following the wording, form and manner prescribed by law. Until the oath or affirmation is taken, MPs may not receive salary, take their seat, speak in debates or vote. They could be fined £500 and – more important – have their seat declared vacant if they attempt to do so. Oath taking in accordance with law by holders of public office is common practice wherever you are. Recently, China’s legislative body, the Standing Committee of the National People’s Congress (NPC), made an interpretation of Article 104 of the Basic Law of Hong Kong, that lawmakers in Hong Kong must take an oath in a lawful manner, read accurately, in its entirety, and in a solemn manner. The oath provided for by the Basic law includes “to uphold the Basic Law of the Hong Kong Special Administrative Region of the People’s Republic of China and swear allegiance to the Hong Kong Special Administrative Region of the People’s Republic of China”. Two members-elect have now been disqualified by Hong Kong High Court from taking office to Hong Kong’s Legislative Council after a recent swearing-in ceremony in which they changed or added to the wording of the oath, advocating “Hong Kong independence”, and insulting the country and nation. Hong Kong is a part of China. “Hong Kong independence” advocates for just the opposite. The so-called “Hong Kong independence” or “Hong Kong self-determination” is aimed at splitting China. No country in the world will permit indulgence toward attempts that openly betray and insult one’s own country and nation, least of all such attempts by holders of public office. The National People’s Congress interpretation is both necessary and timely and is for the sole purpose of safeguarding “one country, two systems”. Interpretation by the National People’s Congress Standing Committee is one of the core contents of the Basic Law and part and parcel of rule of law in Hong Kong. As such, the interpretation enjoys sufficient legal basis and is an embodiment of the spirit of rule of law. The National People’s Congress Standing Committee has always been cautious and careful in exercising its power of interpretation. Since the return of Hong Kong, the National People’s Congress Standing Committee has made four interpretations of the Basic Law on different occasions, all of which have served to ensure the faithful implementation of the Basic Law. The interpretation does not and will not affect the judicial independence of Hong Kong. On the contrary, it will only improve and strengthen Hong Kong’s rule of law. The judicial personnel in Hong Kong will continue to perform their duty in a professional, fair and just way. Rule of law is one of the core values of Hong Kong society. Everyone is equal before the law and nobody should be above the law. Now a handful of “Hong Kong independence” activists, in the name of “democracy” and “freedom of speech”, are carrying out acts that violate the law and destabilise Hong Kong and turning themselves into a public nuisance. These individuals must be held responsible for undermining the rule of law and social order in Hong Kong. But they will never have their way. Hong Kong is a special administrative region of China. Its affairs are China’s internal affairs and no foreign country should interfere. The Central Government of China will continue to fully and faithfully implement the policy of “one country, two systems” and “Hong Kong people administering Hong Kong”, ensure that Hong Kong enjoys a high degree of autonomy, uphold and act in strict accordance with the Constitution and Hong Kong’s Basic Law, and support the Special Administrative Region Government in its effort to maintain prosperity and stability of Hong Kong.